Inspired by the attempts of others, and wanting to achieve a better finish for some parts that we are looking to produce for sale, we decided to put together a vapor bath. Before we got stuck in we watched a few YouTube videos and read a few blogs and decided to come up with a shortlist of considerations that we could use to drive our design. Here's what we came up with. Ideally the enclosure should be able to contain anything we can print on our printer. We figured that a standard heat bed would be a good choice but also considered using some ceramic resistors. Either would need a controller and power supply unit of some sort. 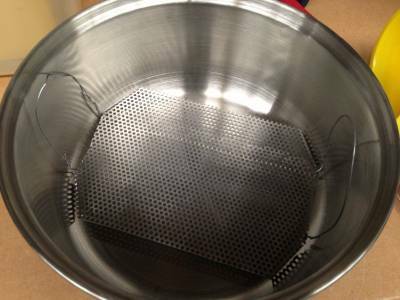 In most of the examples that we saw online the main thing that had not been considered was a way to safety add and remove part from the vapor bath. 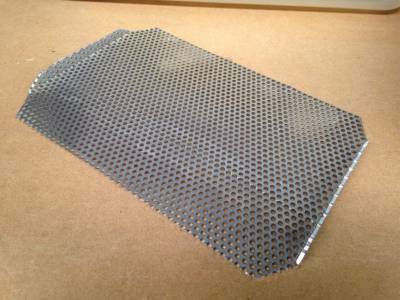 We had some nice perforated aluminum laying around in the workshop so figured that we would make up a platten to place the parts on. Phil had some previous experience with trichloroethane parts cleaners which have a condensor at the top of the enclosure to condense the vapor and return it to the sump - This seemed like a good idea to us and basically consisted of a ring of copper tube that had cold water flowing through it. We decided on a basic fish aquarium - they are cheap, have a flat bottom, come with a lid and seem like the ideal container except that we were not sure about acetones compatibility with silicone so we needed to check that acetone wouldn't simply melt the stuff that held our aquarium together. Armed with our list of considerations we were pretty confident that we could come up with something that would work. 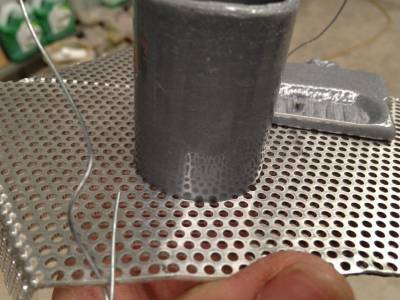 To get a little further inspiration we decided to do a bit more research and stumbled across Solidoodletips blog where he constructed something very akin to the trichloroethane parts washer that we had been pondering over. One feature that we liked very much was that the part was placed much lower than the acetone level improving the vapor distribution. Other videos that we had watched seemed to have an issue getting the vapor to rise high enough to cover the whole part and so this seemed to make a lot of sense. 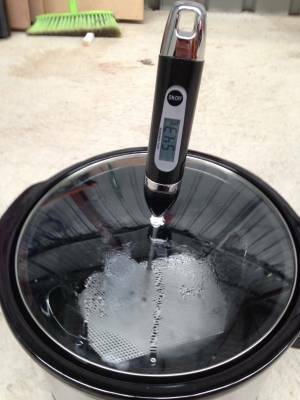 We also found The Great Fredini's blog post about using cooking steamers. This actually seemed like a much better idea than ours. Using a cooking steamer there would be no waiting for a heat bed to be delivered, no wiring up of controllers or PSUs, plus we knew that we could get a steamer dirt cheap from our local Kmart - much cheaper than the sum of the parts that we were planning to use. So deciding to compromise - off to Kmart we went. Unfortunately the steamers that Kmart stocked had plastic baskets for the food which looked like they would melt with the acetone. They did have a deep fat fryer that looked like it might do that job but we were worried about the temperature of the heating element being too hot. 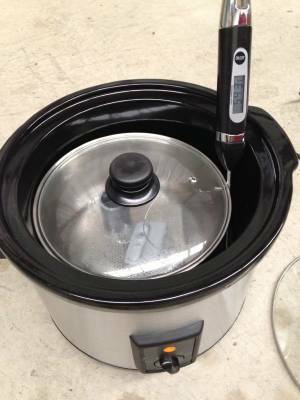 In the end we settled on a slow cooker and found a suitable pan to fit inside it planning to improvise on the idea of placing the part lower than the acetone level. Here's what we ended up with. We also bought a digital BBQ thermometer to help keep an eye on the temps. I bent up a platten from the perforated aluminum and made some handles from some fencing wire so that we could easily lift the platten into and out of the pan. The bent sides act as feet allowing the part to sit above the acetone level. 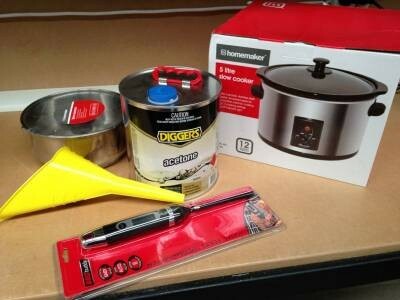 Next up was to assemble everything and fill the slow cooker up with acetone and then set the pan into it. Obviously the pan floats so the pan needed a way of being held into position, unfortunately there was nothing around to make a suitable hold down from so i decided to forgo this and use the acetone directly inside of the slow cooker instead. I will take a look at making a suitable clamp at a later date. Putting everything together I ended up removing the handle from the lid so that the temperature probe could be positioned through the hole, this was so that the lid could be sealed properly. I figured that the slow cooker needs the lid to seal so that it can retain the vapors within the pot and not simply boil dry, this seemed like the best solution. The acetone was added and the cooker set to high. A part was also added to test. It took approximately 30 minutes for the acetone to heat up to the point where it was condensing on the underside of the lid. Here you can see the acetone condensing on the lid, the temperature is measured at 54.3 degrees Celsius which probably means that the actual temperature of the acetone is a little higher (probably about it's 56/57 degree boiling point). As the vapor was generated you could see the base of the part start to get wet, this wetness rose up the side of the part until the part was completely damp. Cool. Things look like they are working! Expecting that the smoothing process would take approximately an hour or so I set my watch to keep a check on the time. What I found was that after a further 30 minutes the temperature inside the pot had kept on rising, in fact it rose right up to nearly 80 degrees and most of the acetone simply boiled away. Adding some more acetone I also opted to add another part at the same time as I wanted to check the difference in processing time between adding a part at the start of the heating process, and adding a part to the already heated pot. One thing that I noticed was that as I lowered the parts into the pot, the new part pretty much instantly ended up in the same condition that the previous part had taken an hour to get to, it basically instantly glossed over. There was no discernible difference between the two. Turning the pot down to it's low setting I left both parts in for a further hour before the acetone again mostly boiled away. I then decided to take the parts out and inspect them. When I removed the parts I noticed that there had been no real further smoothing of the surface but there had been quite a bit of bubbling on the second part. This part had actually been sanded a little prior to being added and so had a slightly different surface finish so this could have been a contributing factor. However, considering that the first part had been in the vapor bath for two hours the finish was merely glossy and not really as smoothed as I would have expected. The base of both parts were also starting to melt and become fused with the perforations in the base. Clearly things were not working out as expected. Not perturbed I had a bit of a rethink. The base was possibly getting too hot, as was the acetone. To counteract this I decided to fill the slow cooker with hot water and then place the second pot inside. The parts were then placed inside of the second pot. Pretty much like you would if you were melting wax or chocolate. 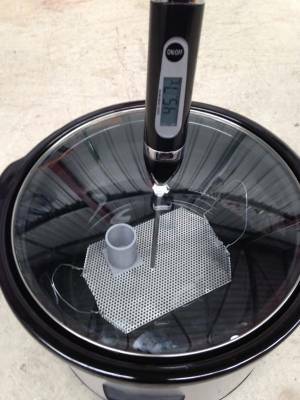 This new configuration had the effect of both lowering the temperature and stabilizing the acetone evaporation. The temperature of the water stayed pretty steady at about 55 degrees - perfect simmering temperature for the acetone. Inspired by what I had witnessed when adding the second part I decided to do a bit of an experiment and only add the parts in for a short while. What I did was to add the part and then place the lid on the pan, I then waited for the acetone to start condensing on the underside of the lid (good job we bought a pan and a cooker with a glass lid) before removing the parts after a further minute or so. I then let the parts dry a little before repeating the process. I found that this gives a much better result. Not only is it quicker, but the effect is much more controlled. Using this method I was even able to smooth out the bubbles that had appeared in one of the parts. Here you can see the reflection of the perforated mesh in one of the parts. The striations left by the printing process have been completely removed. Whilst this looks pretty good other portions of the part still had imperfections but this is most likely due to the initial quality of the parts I used for the test. Overall we deemed the test a success. 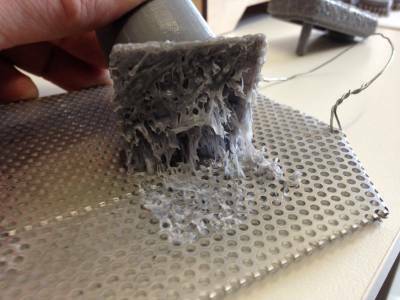 We successfully managed to smooth some ABS parts out with a home made acetone vapor chamber. Sure we concede that the results were not perfect, and there is definitely room for improvement but the basic goal was achieved. The end method ended up a fair bit different from the originally planned process, but as with all things like this, some experimentation is needed before you find what works. We figure that our results differed a little from our original plan due to our use of a slow cooker instead of a steamer. We did consider using a hot plate or electric fry pan but were a little worried about the heat. This is probably a good thing as all that really seems to happen at higher temperatures is that the acetone boils away and evaporates quicker. From what I have seen with our experiment the same result could probably be easily achieved using a large cooking pot with a glass lid and a suitable bowl placed inside. Simply pour some hot water from an electric kettle in the cooking pot, and then place the bowl of acetone in the water. Then suspend your prints over the acetone using a suitable platten and put the lid on the pot. I'm pretty sure that you will get a result with this although without a heat source you may need to replenish the hot water once it cools. Next steps are to repeat the test with some decent parts on a solid platten. The perforations in the platten allowed the part to sink a little which basically ruined the base of the part. At least with a solid base the part would remain flat and hopefully useable. Aluminum definitely seems to be the go as there was no condensation on it at all so I need to go raid my scrap pile and see if I can find a suitable piece to make a new platten out of. Phil is drafting up the final parts and so our next test will be to smooth the actual finished parts.